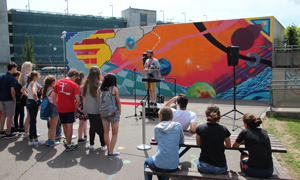 Stick, a local graffiti artist, took the inspiration of the imagery created by ISL's 9th Grade visual arts students and painted a large grey wall on ISL's Playground. It has been a real authentic learning experience for Grade 9 students. Read more about the whole project here!